Greetings family! We are so thankful for all you've done to get us to where we are. Tightshift is launching a $50k crowdfunding campaign through March 30 as a part of a larger fundraising effort for our work. While there are some historical examples, in recent times we see very few models for economic democracy (like worker cooperatives) truly accessible to people who have been incarcerated and others who have been most marginalized in our society. During Tightshift's first two years, we have learned a tremendous amount about the intersection of cooperative work, housing, and healing. We're excited to continue to learn and grow in community in a way that can be scaled and replicated. This fundraiser will help us pay for our healing house in the DC area, our land based healing work, and continue to support Tightshift's operations. Tightshift works with people who are on a path to jail and provides an alternative path, one of beloved community, cooperative entrepreneurship, growing and eating healthy foods, and healing. Juan Reid grew up in the Bloomingdale neighborhood of Washington, DC, where he entered the criminal justice system as a 10 year old child. From that point, he never spent a year of his adolescence outside of a detention center. When he was 18, he was sentenced to 3 years in prison, which grew to 14 years as he continued to catch charges for fighting guards over denying him and other prisoners’ basic rights like hot food and a daily hour of recreation. Seven of those years were spent in solitary confinement. When he got out of jail, he was met with an unsupportive environment. Most employers wouldn’t consider hiring him because of his criminal record. In his community, many others shared his situation, and often felt no choice but to engage in illegal activities in order to make ends meet, even though that put them at risk of going back to jail. Knowing they needed opportunities for economic self-determination and dignified work, with the help of Allison Basile, a local cooperative developer, they co-founded Tightshift Laboring Cooperative LLC, DC’s first worker-owned business for returning citizens and other at-risk youth, and Building Bosses, a 501c3 fiscally sponsored cooperative support organization. Tightshift launched in December 2016, and since then has provided moving, hauling, landscaping, and cleaning services in the DC metro area. Despite beginning with very few resources, we have completed over 300 jobs, generated $75k in revenue in 2017 and $80k in 2018, earned 5 Star ratings on Yelp, and employed 15 member apprentices (starting at $15/hr in 2016 and $17/hr today). Through a crowdfunding campaign and with the support of zero interest loans, Tightshift was able to purchase our own new 16' box truck in November 2018, after 2 years of operating with Uhaul rentals. As one of the only worker cooperatives in Washington, DC, and one of the only worker cooperatives in the country started by and centering formerly incarcerated people, a part of our mission is to share the model with the public to increase support for this type of work. To date, we have shared our story and been featured in Next City Magazine , Yes! Magazine , Shareable , DCist , Good Magazine , WPFW's Taking Action Show , The Lorne Epstein Show , and Juan was the keynote speaker at the fall 2018 launch of the DC Employee Ownership Initiative , a program of the Washington Area Community Investment Fund and Citi. Like other worker cooperatives around the country and world, Tightshift workers join as member apprentices on a 1,000 hour member apprentice track. Even during this period, financials and other information are shared openly, and people are encouraged to weigh in on operational decisions. We don’t expect profits in the first several years, but in our first years we are using the resources we have to support member apprentices with food, transportation, and housing. The biggest challenge with Tightshift’s work is having consistent job for our people. Moving and hauling have good margins, but jobs are often inconsistent. 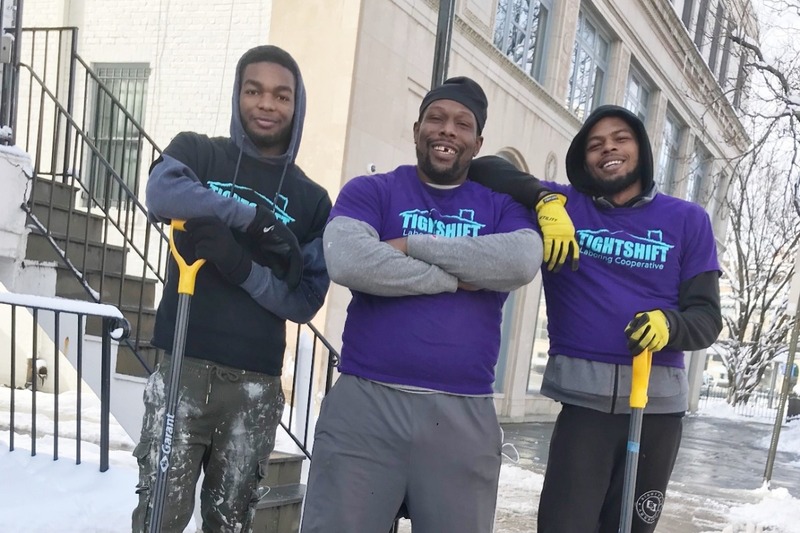 Tightshift needs recurring jobs (which could include cleaning, landscaping, moving, hauling, or any other work we can train our apprentices in). After starting Tightshift Laboring Cooperative, we learned quickly that work was not enough on its own. A big obstacle for our members to show up to jobs rested and on time was a lack of stable housing. To overcome this, we rented a home in University Park, MD, 10 minutes outside of DC, where we have housed 5 members and member apprentices throughout the year. The Tightshift Healing House is more than a home. Members decided that a music studio would be a healing and community building project, so we used our resources to build a booth and buy studio equipment for the basement of the Healing House. We created a time bank where people in the community can access studio time in exchange for helping with Tightshift volunteer tasks. We also host meditation, yoga, movie nights, cook healthy food several times a week, and have an apothecary of herbs to support the minds and bodies of our community. From 2018-2019, Tightshift will spend $35,000 on rent for the Healing House. With the voracity of development and gentrification happening in Washington, DC, it is important that we own our own space, preferably in the District itself. This space can also serve as a community space for people to build relationships, access training and education on cooperatives and other skills. Tightshift members and member apprentices have faced significant trauma in their lives, including neglect, childhood sexual abuse, and being exposed to extreme violence. People who are a part of the Tightshift community are not accessing support, often because social services can feel isolating and not relevant to their lives. 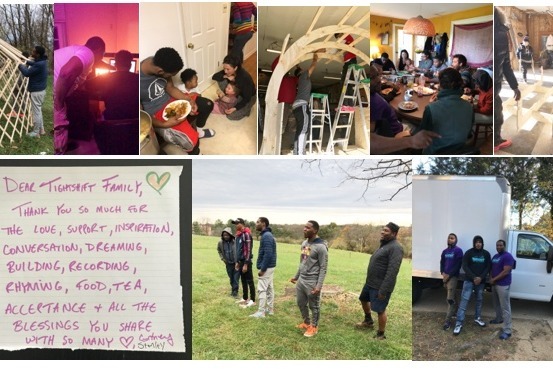 As we grow our resources for this work, Tightshift is creating healing programming rooted in relational culture building, storytelling, creating beloved community, trauma-informed therapy, herbalism, meditation, and more. In November 2018, we held our first Tightshift team retreat where we explored land, shared stories, helped build a yurt and a greenhouse, meditated, ate healthy delicious food, and played on golf carts. This is the type of work we’d like to do for longer time periods and with more frequency, because we see the ways it strengthens each person and our collective. Part of the healing work needed is the opportunity for members to reconnect with the earth in a safe and supported environment. In 2018, Tightshift established a partnership with the School of Living Land Trust and gained access to 70 acres of land in Amherst, VA through an affordable, 99 year lease. We are raising funds in order to build a dormitory, outdoor kitchen, and capacity for the creation of healing programming. - $600,000: Purchase a permanent Healing House and community space in the DC area (to replace $35k per year of current rental fees). - $200,000: Build out a Healing Sanctuary on 70 acres in Amherst, VA, including building a dormitory, outdoor kitchen, farming equipment, and healing programming for 2 years. - $200,000: Support Tightshift’s DC operations, expand paid training opportunities, member visits to other cooperatives around the country, increase coordinating capacity and business development, and equipment maintenance for 2 years.